Reed & Barton ~ Hammered Antique ~ 4-Piece Hostess Set, Price $30.00 in New York, NY from William-Wayne & Co. Proof that classic design never goes out of style, the Hammered Antique fine stainless flatware pattern from Reed & Barton is a versatile beauty that incorporates the look and feel of the finest hand-hammered metal. The teardrop shape is typical of a flatware design that appeared in the 18th century. 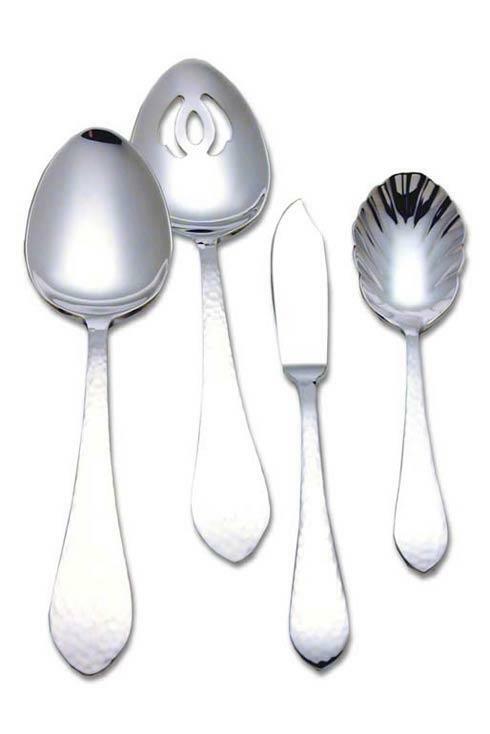 The 4-Piece Hostess Set includes Tablespoon, Pierced Tablespoon, Sugar Spoon and Butter Knife. Elegantly packaged for gift-giving.